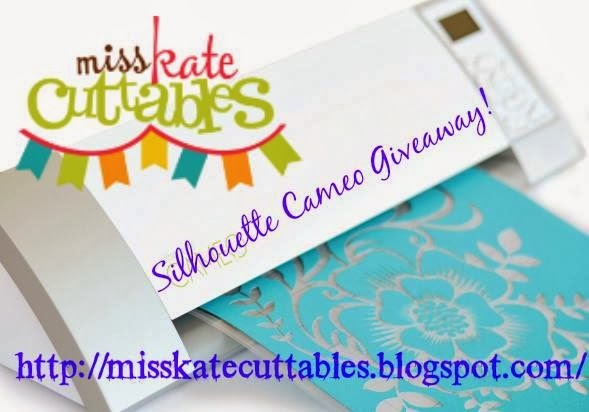 Simply Silhouette: Miss Kate CuttablesNew DT Announcment& Cameo Giveaway! new Miss Kate Cuttables Design Team! be a HUGE giveaway of a Silhouette Cameo! 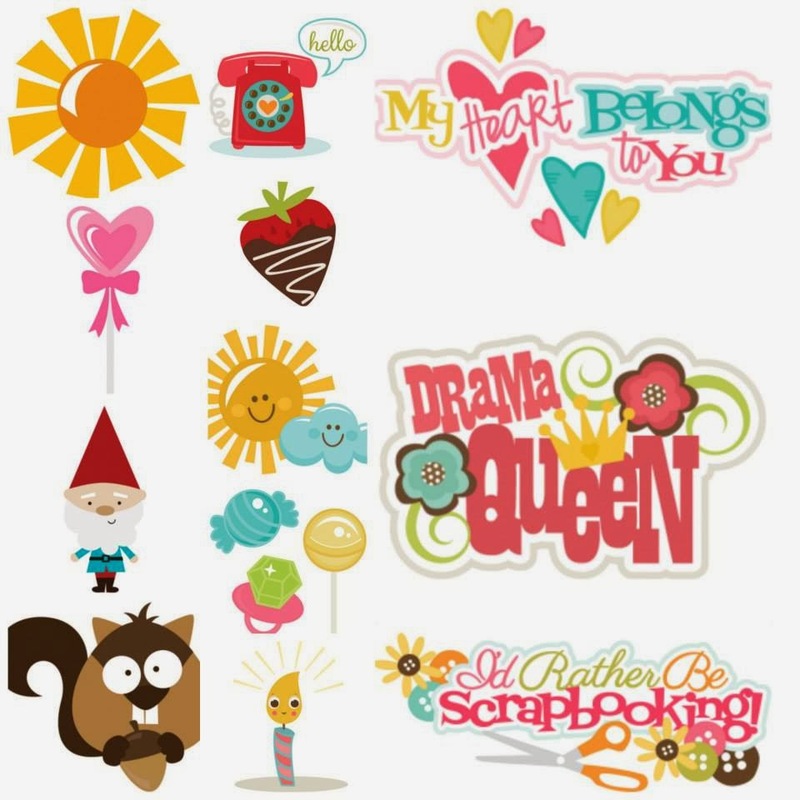 The Scrapbooking Queen when she went to Florida. I created for the tag on the front. Trendy Twine called "Tickled Pink"
Now...on to our fantastic giveaway! Congratulations, Julie, on becoming a DT member for Miss Kate Cuttables! I love her files. Your flamingo is so adorable! Muy linda su idea me encanto y felicitaciones. Congratulations to you and the others on becoming MKC Design Team members! I LOVE your flamingo project and can't wait to see all your upcoming projects. I'm a follower! Absolutely love the flamingo project. Will be following your projects, can't wait to see what's next! Many congratulations n Happy New Year....Ur new follower. lovely candy holder. Congratulations on your announcement of becoming a Design Team Member for Miss Kate Cuttables!! Your flamingo project is too cute! Have fun! Congrats on your new Design Team position. This is going to be a great place to see Miss Kate's projects. Looking forward to learning more with my Cameo, so winning any files would be great. Congrats on making the team. Love your flamingo project!! Congrat on making the team. I love your project. Congratulations Julie, you're an amazing designer and I'm not surprised!!! Super cute flamingo poop project too! SUPER cute project and congrats!! What a FUN project - and such a clever way to share some treats! I'm a new follower and am looking forward to seeing more of your Miss Kate Cuttables projects. Congrats on your DT appointment! Congratulations Julie! You know I love your creations! Your flamingo is adorbs. Great project! New follower of your blog. HAHAHAHA I love it!!! Great sentiment, Great project! Congratulations on becoming a DT member for Miss Kate Cuttables! Love you work, I am a new follower! Congratulations on making the Design Team . I look forward to seeing your projects and learning from this wonderful team. Congrats on becoming a member of the MKC Design Team! 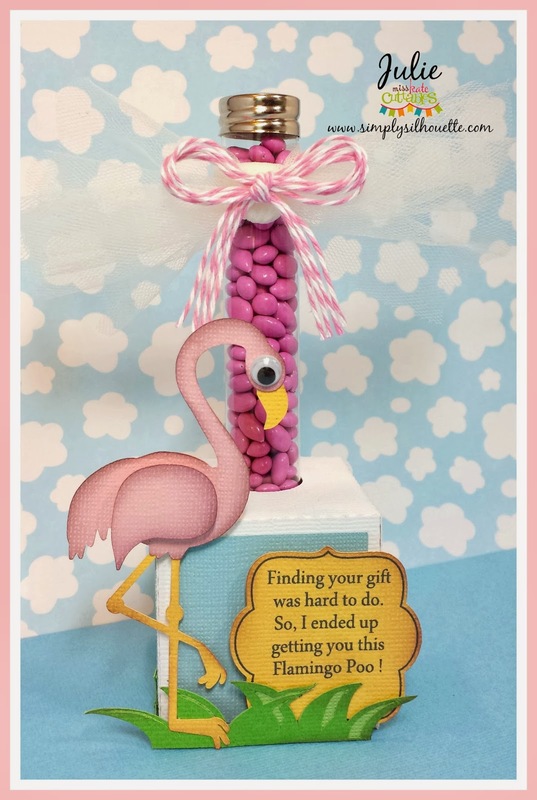 Your flamingo project is absolutely adorable and I look forward to seeing more of your projects! I am a new follower of your blog through Bloglovin! Congrats. I am a new follower and love Miss Kate Cuttables. Love love love your project!! So fun! Cute idea! My little girl loves "flingos", she would love this! Need to put that flamingo on my must have list!! Happy new year! 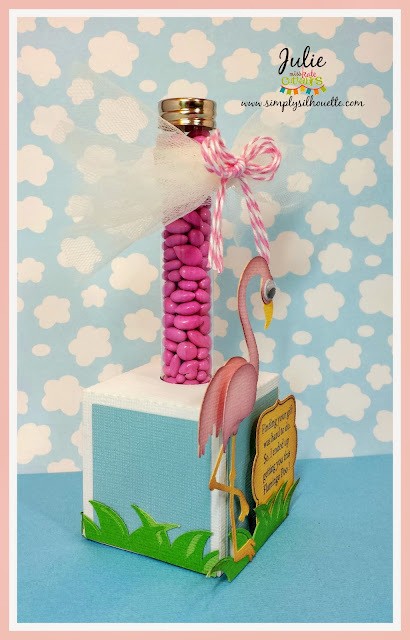 cute project, love the flamingo! What a neat gift, love it! I'm following you now! Love your project! I'm excited to see more! Thanks! Congrats to you my friend!! !TOTALLY cute treat!!! Aww congratulations on making the team, I cant wait to see what you get up to with Miss Kates Files. Your creation is so cute and I love the little poem on it. This is so cute!!! and congratulations!!! Love the flamingo! I lost my best friend to breast cancer, she loved flamingoes. Everytime I see one I just have to smile because of the memories!! following ... love your talent!! I'm excited to learn more!! So cute! That poem is hilarious :) Can't wait to see all of your new MKC creations! How funny, my kids will love it. Looking forward to your designs. just started following. Congrats and it looks like you have great ideas! Thanks for sharing! Looking forward to your great ideas. Just started following you. love the Flamingo. It is always fun to see how people use different files and put them together to make something different. Thanks for giving us the idea. Congrats! I love this project! I absolutely LOVE this!! Happy New Year buddy ~ super excited to be a part of the team with you. Congrats on the new Design Team. I look forwarding to seeing what you share with us! Congrats Julie. What an AMAZING line up for a DT! Can't wait to see what you all create in 2014. I got a Cameo for Christmas so needles to say, I'll be stopping by a lot! I like that pretty trendy twine, it gives it a nice touch. Congrats on being selected for Miss Kate's DT. I love your treats & box it is hilarious...you are talented and have a great sense of humor. I am excited about having the chance to win a Cameo so fingers crossed. Congrats and love your project. I am a follower! I'm a new follower. Congratulations on being on Miss Kate's design team. Your Flamingo Poo gift is super cute. Thank you a cute gift idea, I love it. So excited to see your other creations. Also hope I win the Cameo so I can give it to a friend who can't afford to purchase one and would really use it. Happy New Year... and Congrats on becoming a Miss Kate DT member. I fell in love at first with your amazing Treat Box. You used 2 of my favorite things... The Color Pink and Flamingo's. Looking forward to seeing more of you beautiful creations. Congrats! I am a follower. Love the pink flamingo and poo...very cute. Congratulations on the Design Team. I love the flamingo project! We have teased my mom forever about looking like a flamingo with her long, skinny legs. I will have to make one of these for her birthday. So cute Julie! I love the pink! Following! Can't wait to see what else you make. That is adorable! I am a new follower. Congratulations on making the Design Team, Julie. I love your flamingo candy box! Makes me hope for some sunshine! I became a new Bloglovin' follower today! Adorable project. Congrats on your design team position! So adorable! I'm a follower! Hi Julie - Congratulations on being selected for Miss Kates Cuttables DT - I am a follower of your blog and would love to win that Cameo! Happy New Year! A nice project you created as well! Happy Day! Super cute. Love all ur projects-keep em coming! Loved your flamingo project and I'm following you. Oh my gosh I love this and how appropriate as I live in Florida and this would be so handy for a birthday coming up. I will become a follower!! Those flamingos are so cute!!! congrats on DT!! I love finding all these new blogs! I'm going to be up a while checking them all out. :) How fun!! So much fun! Congratulations on your DT spot. Adorable idea! Cute poem. I've added your blog to my Feedly account and am now following you!. Thanks. Congrats and am now following you...thanks! Julie, this is just too funny!!!! I love the poem, it just makes the gift ... very clever! Thank you for sharing. I am a new follower. Super cute! I've never heard of chocolate covered sunflower seeds. LOL! Great project! This is adorable!!! So creative. I'm an old follower. Love Miss Kate's files. Thanks! Very cute and very unique! Congrats Julie, so happy for you! Love the project! Oh my goodness your project made me giggle. I've just found MKC and alll your wonderful blogs with ideas! So creative. Can't wait to start using my new Cameo! I have a friend who collects flamingoes and this would be a super cute gift for her! Congrats on joining MKC! Congratulations on your DT post! Your Flamingo is so cute, love your project! Congratulations! Love your flamingo project...great idea, too funny! I have been following for you for a while, in many formats, lol. I love this flamingo. Too cute. this is fun and I love the ideas that you will all bring us. What a fun gift idea! I'm so happy to have found all of your ideas. As a fellow scrapper/card maker sometimes new seeds have to be planted. Thanks for sharing. Happy to be a follower, congrats on making the design team! This is such a cute project. Congratulations on being a part of the DT. I look forward to seeing what you create. Congratulations on the design team! Love the project and can't wait to see what is in store!! Congratulations on your new post on the DT. Oh my goodness the flamingo and his flamingo poo is adorable!! Your flamingo project really made me smile! I am a new follower of yours,, and I'm so happy I found you blog! I have become a follower of your blog. What a wonderful resource of inspiration. Thanks for sharing. Oh .. and Congrats on the DT. LOVE the flamingo poop idea!! Brilliant! Already a follower. Congrats! I followed with the google plus! Such cute projects! Silly me I forgot which blog I am on of course I am already a follower of you! I wouldn't ever want to miss your projects and this one is the cutest thing! 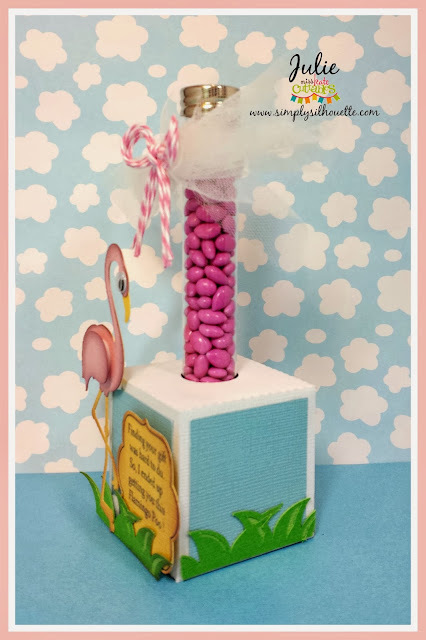 I love these test tube holders and love that flamingo! Congrats you deserved because you made beautiful cards that inspired me. Following your blog. Flamingos, ahhh. I'm thinking of Florida. Too much snow here. Nice. New follower. Great way to start the New Year!! Entered and shared! Super cute idea. I am a new follower. Very cute! Congrats on becoming part of the DT! Love looking at all of your new ideas! Keep them coming! Congrats! I'm a new follower. Looking forward to all the great new ideas. Adorable Project. I am a new follower and so inspired!!! Thank you. Florida girl here with a thumbs up for the cute Flamingo! Now following with FB! This is just adorable, my sister who lives in Florida would so love this! Great job and I am a long time follower too! Love your cute flamingo and I'm a new follower. i have a dear friend that would love to get the sweet flamingo..hope to win to make it for her..
Love the flamingo - new follower too! Congratulations, Julie!!! :) Love your cute project! Thank you so much for taking the time to share! So excited to be a new follower! Love your flamingo project! Thanks for sharing and I love your blog! Cute project!! Following your blog - can't wait to see more!! Following via blogger!! Congrats on the design team position ladies!! Your project is really cute, I love it. Congratulations!! Love your adorable flamingo!! This is too cute! My sister loves flamingos. adorable project, new follower! thanks for the chance to win! This is so cute! I am a sucker for pink flamingos! Thanks for the chance to win. Congrats on making the DT! Beautiful projects. Sometimes it's a contest that leads us to a great blog. Beautiful Flamingo! Thank you for sharing! How fun! I love your treat holder! So very cute. I'm your newest follower! :-) I'm excited to see what you create next. New Follower- Great project, love that Flamingo!! What a cute project!! Of course I am already a follower!! Congratulations on making the MKC team! Fun project! Following...love the pink flamingo! Congrats on joining the design team! Julie, congrats on the DT!!! And your project is super cute!!!! :) Thanks for sharing!!! This is so stinkin' cute! I'm now a follower. This is both adorable and hilarious! So love it! you are very talented! So very adorable and hilarious as well1You are very talented! thank you so very much for sharing! Thank you for sharing this hilarious and adorable project! You are very talented! So super cute and adorable as well as hilarious! Great work! Adorable Flamingo and what a great idea! Too cute! I'm a follower! Thanks for a chance to win! Following your blog now. Thank you for the contest! !